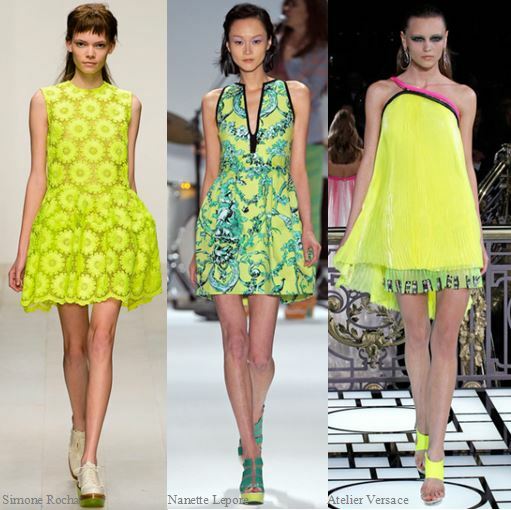 Simone Rocha, Nanette Lepore & Versace were just a few of the designers who showed bold pops of neon and fluorescent hues on the runways this spring. This trend is a bit tricky because it’s easy to go overboard and find yourself looking like a fashion victim of the 1980’s. If you’re brave enough to go for a bright yellow dress like the looks above be sure to soften the glow with a complimentary shade of turquoise or pink… even black tends to dial down the bright factor a bit.